1 C None No Power Seat 1 C is a standard First Class bulkhead seat. This seat is great when traveling with a partner. 1 D None No Power Seat 1 D is a standard First Class bulkhead seat. This seat is great when traveling with a partner. 11 A None No Power Seat 11 A is a Business Class bulkhead seat with extra legroom allowing the passenger to lie straight instead of at an angle. Many passengers enjoy the exclusive feel of this mini-cabin. 11 D None No Power Seat 11 D is a Business Class bulkhead seat with extra legroom allowing the passenger to lie straight instead of at an angle. Many passengers enjoy the exclusive feel of this mini-cabin. 11 F None No Power Seat 11 F is a Business Class bulkhead seat with extra legroom allowing the passenger to lie straight instead of at an angle. Many passengers enjoy the exclusive feel of this mini-cabin. 11 K None No Power Seat 11 K is a Business Class bulkhead seat with extra legroom allowing the passenger to lie straight instead of at an angle. Many passengers enjoy the exclusive feel of this mini-cabin. 12 A None No Power Seat 12 A is a Business Class seat that has a misaligned window. Many passengers enjoy the exclusive feel of this mini-cabin. 12 D None No Power Seat 12 D is a standard Business Class seat. Many passengers enjoy the exclusive feel of this mini-cabin. 12 F None No Power Seat 12 F is a standard Business Class seat. Many passengers enjoy the exclusive feel of this mini-cabin. 12 K None No Power Seat 12 K is a Business Class seat that has a misaligned window. Many passengers enjoy the exclusive feel of this mini-cabin. 14 A None No Power Seat 14 A is a Business Class bulkhead seat with extra legroom, allowing the passenger to lie straight instead of at an angle. The position of the bassinet and proximity to the lavatory may be bothersome. 14 K None No Power Seat 14 K is a Business Class bulkhead seat with extra legroom, allowing the passenger to lie straight instead of at an angle. The position of the bassinet and proximity to the lavatory may be bothersome. 15 D None No Power Seat 15 D is a Business Class bulkhead seat with extra legroom allowing the passenger to lie straight instead of at an angle. The position of the bassinet and proximity to the lavatory may be bothersome. 15 F None No Power Seat 15 F is a Business Class bulkhead seat with extra legroom allowing the passenger to lie straight instead of at an angle. The position of the bassinet and proximity to the lavatory may be bothersome. 18 A None No Power Seat 18 A had a misaligned window. 18 K None No Power Seat 18 K had a misaligned window. 2 C None No Power Seat 2 C is a standard First Class seat. This seat is great when traveling with a partner. 2 D None No Power Seat 2 D is a standard First Class seat. This seat is great when traveling with a partner. 20 A None No Power Seat 20 A is a standard Business Class seat. This seat has a misaligned window. 20 K None No Power Seat 20 K is a standard Business Class seat. This seat has a misaligned window. 31 A None No Power Seat 31 A is a standard Economy seat that Singapore Air designates as a "Forward Zone Seat". Forward Zone Seats enable you to be among the first in Economy Class to disembark the plane. You may select these seats in advance for free when you book a Flexi fare type. When you book a Lite or Standard fare type, there is an additional fee for this seat. This seat is missing a window. The tray table is in the armrest, making the armrest immovable and slightly reducing seat width. There is no floor storage during takeoff and landing. 31 B None No Power Seat 31 B is a standard Economy seat that Singapore Air designates as a "Forward Zone Seat". Forward Zone Seats enable you to be among the first in Economy Class to disembark the plane. You may select these seats in advance for free when you book a Flexi fare type. When you book a Lite or Standard fare type, there is an additional fee for this seat. Passengers requiring a bassinet are often placed here. The tray table is in the armrest, making the armrest immovable and slightly reducing seat width. There is no floor storage for this seat during take-off and landing. 31 C None No Power Seat 31 C is a standard Economy seat that Singapore Air designates as a "Forward Zone Seat". Forward Zone Seats enable you to be among the first in Economy Class to disembark the plane. You may select these seats in advance for free when you book a Flexi fare type. When you book a Lite or Standard fare type, there is an additional fee for this seat. Passengers requiring a bassinet are often placed here. The tray table is in the armrest, making the armrest immovable and slightly reducing seat width. There is no floor storage for this seat during take-off and landing. 31 D None No Power Seat 31 D is a standard Economy seat that Singapore Air designates as a "Forward Zone Seat". Forward Zone Seats enable you to be among the first in Economy Class to disembark the plane. You may select these seats in advance for free when you book a Flexi fare type. When you book a Lite or Standard fare type, there is an additional fee for this seat. Passengers requiring a bassinet are often placed here. The tray table is in the armrest, making the armrest immovable and slightly reducing seat width. There is no floor storage for this seat during take-off and landing. 31 E None No Power Seat 31 E is a standard Economy seat that Singapore Air designates as a "Forward Zone Seat". Forward Zone Seats enable you to be among the first in Economy Class to disembark the plane. You may select these seats in advance for free when you book a Flexi fare type. When you book a Lite or Standard fare type, there is an additional fee for this seat. Passengers requiring a bassinet are often placed here. The tray table is in the armrest, making the armrest immovable and slightly reducing seat width. There is no floor storage for this seat during take-off and landing. 31 G None No Power Seat 31 G is a standard Economy seat that Singapore Air designates as a "Forward Zone Seat". Forward Zone Seats enable you to be among the first in Economy Class to disembark the plane. You may select these seats in advance for free when you book a Flexi fare type. When you book a Lite or Standard fare type, there is an additional fee for this seat. Passengers requiring a bassinet are often placed here. The tray table is in the armrest, making the armrest immovable and slightly reducing seat width. There is no floor storage for this seat during take-off and landing. 31 H None No Power Seat 31 H is a standard Economy seat that Singapore Air designates as a "Forward Zone Seat". Forward Zone Seats enable you to be among the first in Economy Class to disembark the plane. You may select these seats in advance for free when you book a Flexi fare type. When you book a Lite or Standard fare type, there is an additional fee for this seat. Passengers requiring a bassinet are often placed here. The tray table is in the armrest, making the armrest immovable and slightly reducing seat width. There is no floor storage for this seat during take-off and landing. 31 J None No Power Seat 31 J is a standard Economy seat that Singapore Air designates as a "Forward Zone Seat". Forward Zone Seats enable you to be among the first in Economy Class to disembark the plane. You may select these seats in advance for free when you book a Flexi fare type. When you book a Lite or Standard fare type, there is an additional fee for this seat. Passengers requiring a bassinet are often placed here. The tray table is in the armrest, making the armrest immovable and slightly reducing seat width. There is no floor storage for this seat during take-off and landing. 31 K None No Power Seat 31 K is a standard Economy seat that Singapore Air designates as a "Forward Zone Seat". Forward Zone Seats enable you to be among the first in Economy Class to disembark the plane. You may select these seats in advance for free when you book a Flexi fare type. When you book a Lite or Standard fare type, there is an additional fee for this seat. This seat is missing a window. The tray table is in the armrest, making the armrest immovable and slightly reducing seat width. There is no floor storage during takeoff and landing. 32 A None No Power Seat 32 A is a standard Economy seat that Singapore Air designates as a "Forward Zone Seat". Forward Zone Seats enable you to be among the first in Economy Class to disembark the plane. You may select these seats in advance for free when you book a Flexi fare type. When you book a Lite or Standard fare type, there is an additional fee for this seat. This seat is missing a window. 32 K None No Power Seat 32 K is a standard Economy seat that Singapore Air designates as a "Forward Zone Seat". Forward Zone Seats enable you to be among the first in Economy Class to disembark the plane. You may select these seats in advance for free when you book a Flexi fare type. When you book a Lite or Standard fare type, there is an additional fee for this seat. This seat is missing a window. 41 A None No Power Seat 41 A is a standard Economy seat, however, this seat has a misaligned window. 41 K None No Power Seat 41 K is a standard Economy seat, however, this seat has a misaligned window. 42 C None No Power Seat 42 C juts into the aisle and is often bumped by service carts and other passengers during flight. 42 H None No Power Seat 42 H is a standard Economy seat however, the proximity to the lavatory and galley may be bothersome. 42 J None No Power Seat 42 J is a standard Economy seat however, the proximity to the lavatory and galley may be bothersome. 42 K None No Power Seat 42 K is a standard Economy seat however, the proximity to the lavatory and galley may be bothersome. 43 A None No Power Seat 43 A may have limited recline. The proximity to the lavatory and galley may be bothersome. As one of the only twosomes in Economy Class, this seat is preferred when traveling with a partner. 43 C None No Power Seat 43 C is a standard Economy seat however, the proximity to the lavatory and galley may be bothersome. As one of the only twosomes in Economy Class, this seat is preferred when traveling with a partner. 43 D None No Power Seat 43 D is a standard Economy seat however, the proximity to the lavatory and galley may be bothersome. 43 E None No Power Seat 43 E is a standard Economy seat however, the proximity to the lavatory and galley may be bothersome. 43 G None No Power Seat 43 G is a standard Economy seat however, the proximity to the lavatory and galley may be bothersome. 44 A None No Power Seat 44 A is an Exit Row seat. This seat does not have a window. The proximity to the exit door may be bothersome as it protrudes out from the wall. The tray table is in the armrest, making the armrest immovable and slightly reducing seat width. There is no floor storage for this seat during take-off and landing. 44 B None No Power Seat 44 B is a Singapore Airlines Preferred Seat. This seat has extra legroom. The proximity to the lavatory and galley may be bothersome. The tray table is in the armrest, making the armrest immovable and slightly reducing seat width. There is no floor storage for this seat during take-off and landing. 44 C None No Power Seat 44 C is a Singapore Airlines Preferred Seat. This seat has extra legroom. The proximity to the lavatory and galley may be bothersome. The tray table is in the armrest, making the armrest immovable and slightly reducing seat width. There is no floor storage for this seat during take-off and landing. 44 D None No Power Seat 44 D is an Economy bulkhead seat with extra legroom. The position of the bassinet and proximity to the lavatory and galley may be bothersome. The tray table is in the armrest, making the armrest immovable and slightly reducing seat width. There is no floor storage for this seat during take-off and landing. 44 E None No Power Seat 44 E is an Economy bulkhead seat with extra legroom. The position of the bassinet and proximity to the lavatory and galley may be bothersome. The tray table is in the armrest, making the armrest immovable and slightly reducing seat width. There is no floor storage for this seat during take-off and landing. 44 G None No Power Seat 44 G is an Economy bulkhead seat with extra legroom. The position of the bassinet and proximity to the lavatory and galley may be bothersome. The tray table is in the armrest, making the armrest immovable and slightly reducing seat width. There is no floor storage for this seat during take-off and landing. 44 H None No Power Seat 44 H is a Singapore Airlines Preferred Seat. This seat has extra legroom. The proximity to the lavatory and galley may be bothersome. The tray table is in the armrest, making the armrest immovable and slightly reducing seat width. There is no floor storage for this seat during take-off and landing. 44 J None No Power Seat 44 J is a Singapore Airlines Preferred Seat. This seat has extra legroom. The proximity to the lavatory and galley may be bothersome. The tray table is in the armrest, making the armrest immovable and slightly reducing seat width. There is no floor storage for this seat during take-off and landing. 44 K None No Power Seat 44 K is an Exit Row seat. This seat does not have a window. The proximity to the exit door may be bothersome as it protrudes out from the wall. The tray table is in the armrest, making the armrest immovable and slightly reducing seat width. There is no floor storage for this seat during take-off and landing. 53 B None No Power Seat 53 B has restricted legroom. 53 C None No Power Seat 53 C has restricted legroom. 53 H None No Power Seat 53 H has restricted legroom. 53 J None No Power Seat 53 J has restricted legroom. 55 C None No Power Seat 55 C juts into the aisle and is often bumped by service carts and other passengers during flight. 55 H None No Power Seat 55 H juts into the aisle and is often bumped by service carts and other passengers during flight. 56 A None No Power Seat 56 A is in the last row of the aircraft and may have limited recline. The proximity to the lavatory and galley may be bothersome. As one of the only twosomes in Economy Class, this seat can be nice when traveling with a partner. 56 C None No Power Seat 56 C is in the last row of the aircraft and may have limited recline. The proximity to the lavatory and galley may be bothersome. 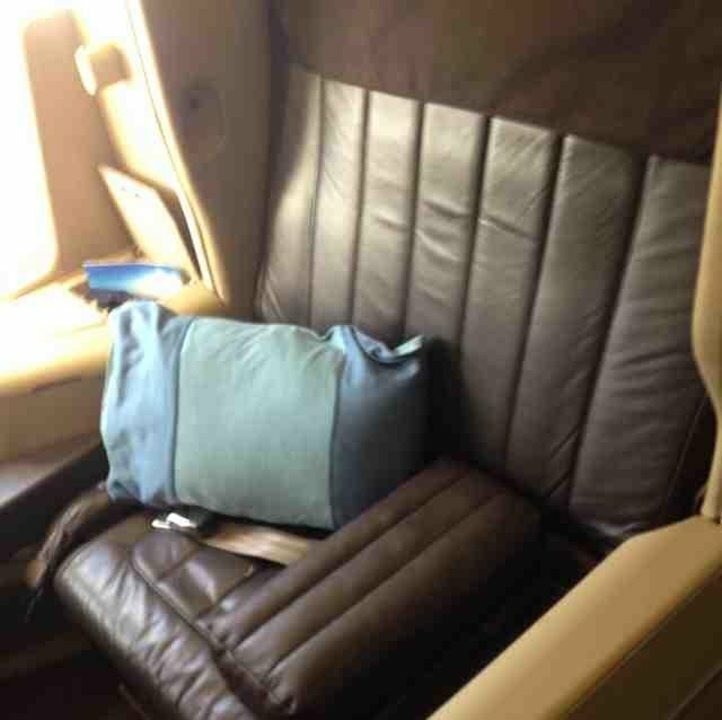 As one of the only twosomes in Economy Class, this seat can be nice when traveling with a partner. 56 D None No Power Seat 56 D is in the last row of the aircraft and may have limited recline. The proximity to the lavatory and galley may be bothersome. 56 E None No Power Seat 56 E is in the last row of the aircraft and may have limited recline. The proximity to the lavatory and galley may be bothersome. 56 G None No Power Seat 56 G is in the last row of the aircraft and may have limited recline. The proximity to the lavatory and galley may be bothersome. 56 H None No Power Seat 56 H is in the last row of the aircraft and may have limited recline. The proximity to the lavatory and galley may be bothersome. As one of the only twosomes in Economy Class, this seat can be nice when traveling with a partner. 56 K None No Power Seat 56 K is in the last row of the aircraft and may have limited recline. The proximity to the lavatory and galley may be bothersome. 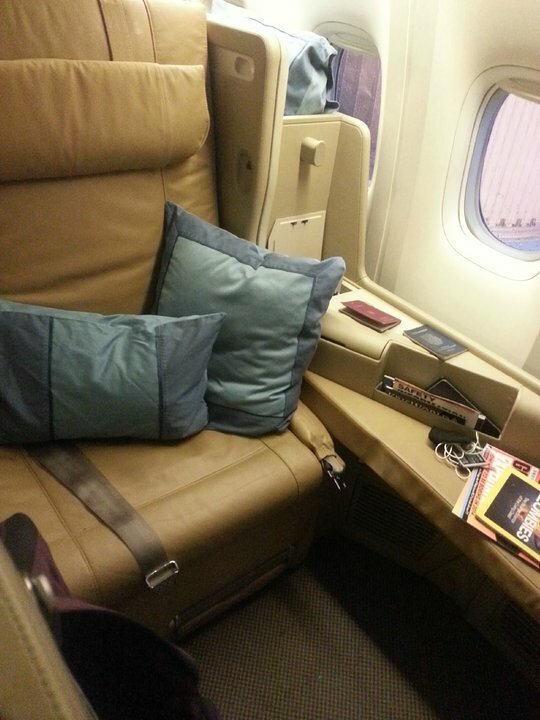 As one of the only twosomes in Economy Class, this seat can be nice when traveling with a partner. Each seat has a 110V AC power port as well as multi-media plugs (USB, RJ45, Chinch Video-In). Great seat, has worry free recline! Great seat for sleeping! 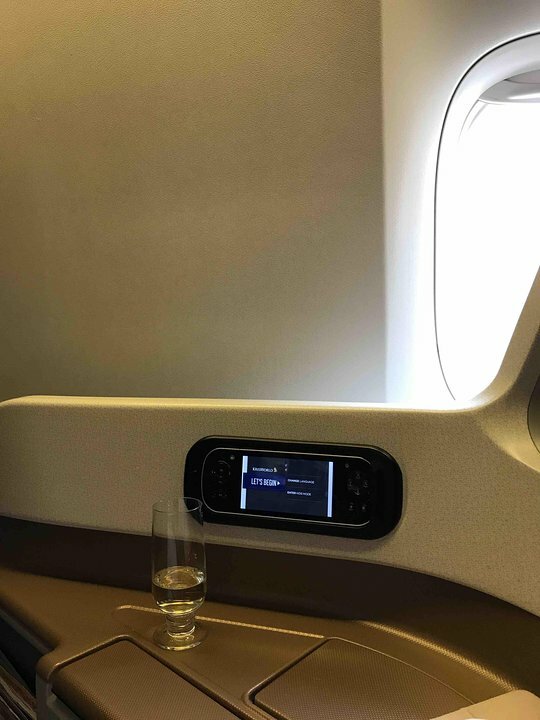 I flew SIN-SFO on Singapore Airlines. The Seat is one of the biggest in terms of economy class. Very Enjoyable. 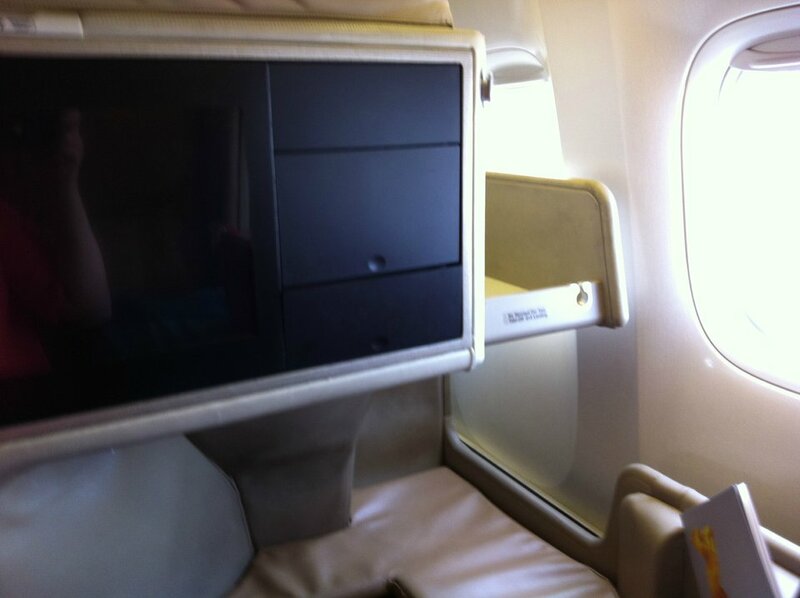 Seats in some seats in column D has the inflight entertainment box which limits leg room to some extent. Seat 50G lacks overhead baggage bin space. The feel of the mini cabin is great. Hardly any noise and no baby capsules in this area. The seat itself is good but the seat is set back to far from the window making it difficult to view out. Selection of movies to watch was pretty woeful on this flight. packed Econ. cabin, legroom is good. Very good entertainmentsystem, excellent food/drinks and choice. Bad is: from windowseat you have to get over 2 sleeping persons to get to bathroom or so. We traveled in row 38 from Melbourne to Singapore and 36 from Singapore to Melbourne. I am tall and the legroom is excellent for economy. I could sit without my knees against the seat in front or stretch out underneath. The entertainment system for these flights was also great with large screens and plenty to choose from. The new Business class seat is not as comfortable! Stay away from these seats at the back. I suffered throughout the 18hour flight from SIN>>SFO. The smell you get from coming from the toilet is no joke on a full flight! Being tall (1.96m) this seat was not very comfortable at all. My wife also suffered, and she is much shorter than me. Frankly appalled at the poor use of space, putting too little into the length and too much into the width. The service, the staff and the food were very good. Writing this in the lounge at Changi, not looking forward to another 12 hour leg to Rome in a similar seat. Great update to the 777 business class. More modern looking, better entertainment interface and new touch screen controller. This week I flew from Frankfurt to Singapore, paying extra for this seat. It was terrible. The crew and passengers passing by have to round the corner of the galley and several times people trod on my feet and also grabbed hold of the screen to steady themselves while I watching a movie. Absolutely not worth paying for. Excellent economy seats on this aircraft. 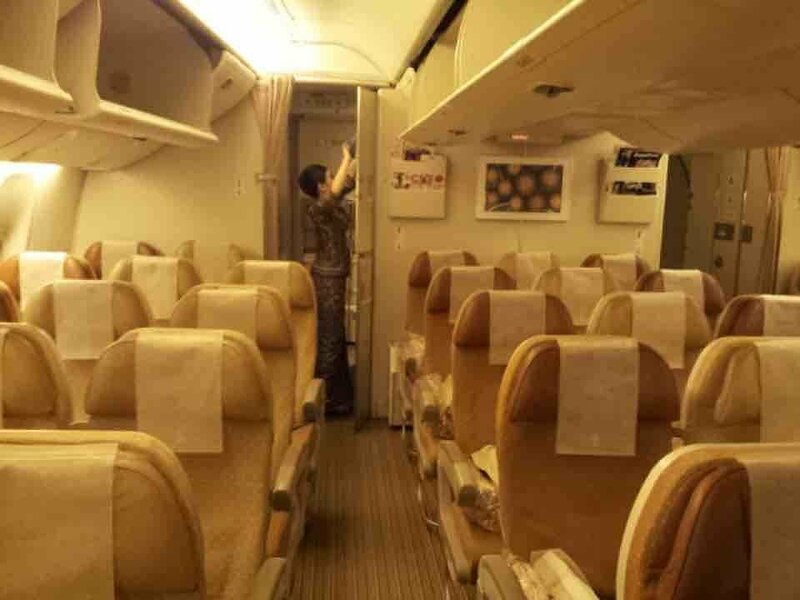 I was sitting in the main economy cabin, still it was spacious and very comfortable. SIA really got this configuration right for B777 300ER - my best flying experience on economy indeed, from SIN to FRA. Standard Seat for new 77W, great and spacious, with 18 inch of screen. nice arrangement with many storage for mobile etc. also very good for the flat bed lack - seems difficult to see the outside. There is an entertainment box below the seat in front, restricting leg room / hand luggage storage, so this seat should be rated yellow. Recently completed return trip AKL SIN. While these seats are great need to be aware that for night flights light from galley/ kitchen area can be bothersome if trying to sleep or watch movies. Also since these are next to bassinet seats can be noisy if parents with infants are in the bassinet seats. There is a box for the inflight entertainment system under the seat in front and thus reduces leg room. The footrest cutout for seat 2F impacts the bed when lying flat in seat 1F. The bed in this row is significantly shorter than the beds in row 2 because of this cut out making it uncomfortable for taller travelers. The seats generally in this B777 flight is fantastic. The width is a little more and is very good for long haul. This was probably one of the most comfortable long haul flights I have taken. For preferred row 31 seats, adding to my previous comment, you will find the best food on the menu is not available anymore as you are the last row from the pantry. The preferred seats have issues. The one on the isle, C and H, you get hit by staff and passengers against your legs and feet, very annoying. Seats are very 'hollow' and my back hurts from them. The middle seats are also bad if the isle seat wants to read, their light shines directly in your face! Extremely annoying and bad design. I think the 'window' (No windows too) seat is ok as you can rest your legs on the exitbox. Seats are very uncomfortable for long haul. Most comfortable economy seat that I can remember (& flight > 11 hour). Service was also excellent, worth the extra cost. This seat is perfect! It is exactly between both lavatories, which makes it very quiet and barely disturbed by flush sounds. Also, as this seat is in the aisle, you have only 50% of chances to be disturbed when the passenger on 51E whant to leave. I was even luckier because there was a couple on the other two seats (51E and 51G), so the woman in the middle seat only disturbed his partner when going to lavatory. A very good seat, Quiet and a goos sleep, the fold over system provides better room for the passenger. Good service, but poor quality amenity pack compared to some others. Not a major issue. While the seat is really wide and comfortable for eating or working, it's a terrible seat for sleeping, it's not long enough so you have to lie sideways to get sufficient space...and it's still not enough. What were they thinking when they introduced this seat? I really preffered the previous 2-2-2 buisness class layout. Surely that seat is not going to last. In the mean time I recommend fying their older version of business class seats or obviously Cathay in the region is always the reference. Not only is this seat frequently bumped by carts and passengers, but the area behind it (row 43 which has no C seat) is often occupied by people waiting for the toilet. Noisy, a lousy seat. This seat is not worth paying for as a preferred seat. No stowage, the aisle narrows and trolleys cannot get this far, everybody comes and does their excercises in front of you, the table is too small and flimsy, and you are constantly being elbowed by people walking past or queuing for toilets. Terrible seat. I have the great opportunity to upgrade to Business class and this is definitely a luxury seat. Fantastic location with private touch. I never had to wait to use the bathroom as the area only has 8 business seats right behind the first class. Great choice and wonderful service from SIA crew as usual. Very recommended seat if you can afford it (I hope to be able again in a future). The conversion to bed is very cumbersome. I missed the touch sensitive buttons for changing the angles. Found that one has to take an angular position to stretch the legs, rather then lying along the longitudinal axis of the aircraft (which is the normal seat orientation). Calling cabin crew every time for changing from bed to seat is also bothersome. With all the space taken by the very wide seats, it could have been better designed. Fantastic location - front bulkhead gives greater room that typical. Mini-cabin makes it feel like first class. Two bathrooms are shared by 8 people, and they are of great size. Three windows to yourself is a great reason to book early and book often. We missed our flight due to the weather. We had to upgrade to business class in order to confirm a seat for the next flight. At 4 times the price, it is a killer but 4 console seats in a row that completely reclines to a flat bed, first class service, the best in entertainment and restaurant quality food made business class a quadruple threat. The last row was not an issue. You can pick up some voices in the next cabin but the noise canceling head phones provided a quiet sleep on the flatbed in business class. This seat and 43A both had full recline and no seating behind them, making them good seats other than the galley noise/light issues. Excellent seat, very comfortable, lots of space, enjoy the sleep bed, bedding and thanks very much for the seat belt when sleeping as I do not have to be woken up to secure the seat belt; tv screen could be bigger but otherwise nothing to complain about. The mini cabin is a great exclusive feeling. Four seats abreast - wow - this is luxury.